Robinsons double concentrate apple and blackcurrant squash gives you twice as much juice for your money. Perfect for pepping you up on warm days or during the mid afternoon dip, it is a cool and refreshing alternative to tea, coffee and other caffeinated drinks. Each bottle contains an estimated 70 servings (based on a dilution of 1 part juice: 9 parts water), making each glass great value for money. 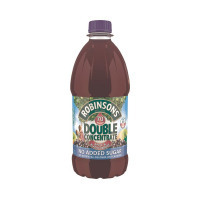 Keep yourself refreshed with Robinsons fruit squash!